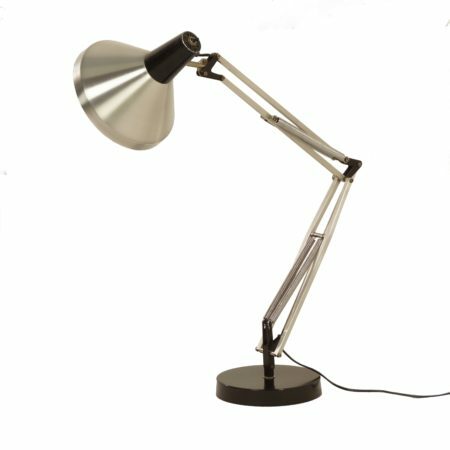 Architects Desk Lamp T9 made at the Dutch company Hala in ca. 1967. This desk lamp is fully adjustable. The light bulb can be switched by means of a switch on the hood. Considering its age, this Hala desk lamp is still in very good vintage condition and the wiring has been checked. The diameter of the hood is 20 cm and the diameter of the foot is 18 cm. Material: iron, aluminium. Source: Catalogue Hala 1967, page 32.